Those words are particularly relevant for today’s investors, faced with a flood of investment advice from all kinds of sources claiming to have the keys to investing success. While it’s tempting to turn the reins over to an adviser who promises to take care of everything related to your investments, the prudent investor applying Solomon’s – and Jason Hartman’s — formula for success will take responsibility for weeding out bad advice and seeking out the good. How does a new investor sort it all out? The answer, according to Jason Hartman’s 10 Commandments for Investing Success – and to King Solomon as well – is education. It’s wise to learn about investing, understand common terms and know the general principles that govern the kind of investing you’re interested in. It can pay to follow major investing experts and financial management sites to learn what’s current in the market and to get an idea about trends for the future. Read widely in order to get a sampling of prevailing theories and opinions. Talking to others making the same kind of investing decisions can help too. It may also be wise to simply keep abreast of national news. Issues related to the housing market, for example, have gone far beyond the financial pages, making front-page news because of their impact on the economy as a whole. International news, too, offers clues and information about the behavior of certain kinds of investment instruments such as bonds. Armed with this kind of knowledge, a new investor can evaluate the advice offered by investment counselors, financial advisers and the like. That kind of discernment leads the way to finding the right advice from the best source, and an adviser who understands an individual investor’s goals and wishes. Investors familiar with the process are better able to spot bad advice and risky investments, and can make better decisions to protect their own interests. The popular Serenity prayer says, “Grant me the wisdom to change what I can, accent the things I can’t change – and the wisdom to know the difference.” That wisdom to know the difference — between good and bad investing advice, and between sound and risky investments — is the key to investing success. 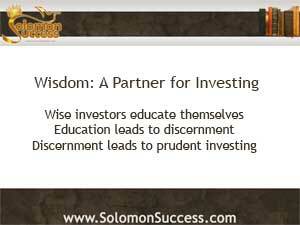 Knowledge supports discernment, and both lead to prudence — King Solomon’s essential virtues for living wel and for creating investment income.